Thirty-Six Groups Sign on to Help Fight the CIA’s Covert Attack on Declassification Review. And What’s Next?? Under the CIA's new regs, this logo would cost 15 dollars to print. Thirty-six groups have signed on to fight to force the CIA to repeal new regulations which charge the public outrageous fees for the opportunity to challenge its secrecy claims. 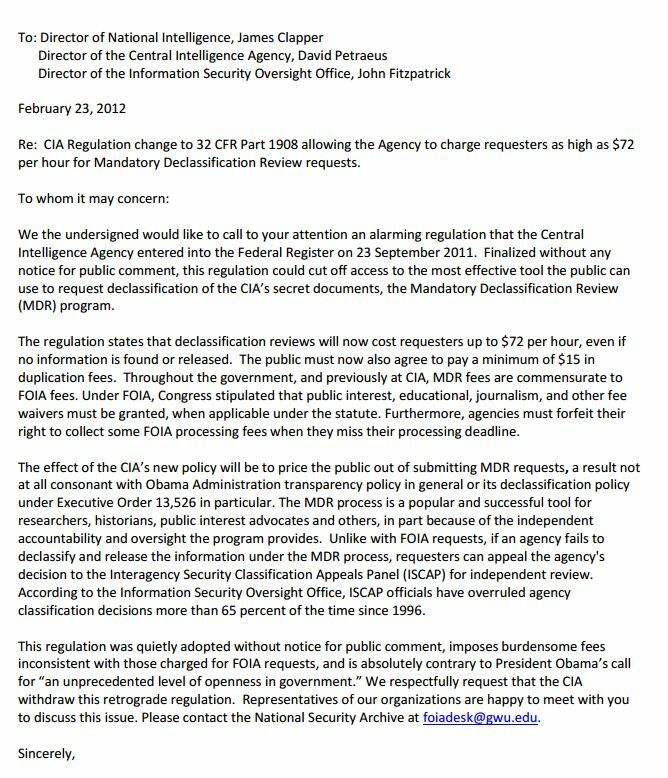 The fees, which can run requesters up to $72 per hour even if no information is found or released, effectively cut off access to a system that researchers, historians, public interest advocates and others have used successfully to challenge the CIA’s extreme secrecy — the Mandatory Declassification Review process. For background of how –and why (to evade accountability)– the Agency did this, see here. Below is the text of the letter which was sent to the Director of National Intelligence, James Clapper; the Director of the Central Intelligence Agency, David Petraeus; and the Director of the Information Security Oversight Office, John Fitzpatrick. There is also an online petition for individuals that oppose this regulation to sign here. The Obama administration could probably fix this problem with one phone call to the Agency. After all, the President would look extremely hypocritical this April if he traveled to the Open Government Partnership annual meeting in Brasilia, Brazil and was asked why his administration allowed this extreme step back for transparent government to occur during its watch. The CIA’s action also certainly merits Congressional investigation. The Senate Judiciary Committee and House Committee on Oversight and Government Reform have strong records of protecting citizen’s access to government information. Senators Leahy, Cornyn, and Grassley –longtime advocates for the public’s right to know– will be quick to recognize the impropriety of this CIA action. Do your representatives fight for your ability to access information? Give them a call or sent them a letter. Finally, there’s a lever that the Director of the Information and Security Oversight Office, John Fitzpatrick, could pull. President Obama’s Executive Order on Classification (13526) states in section 6.2(c) that, “The Attorney General, upon request by the head of an agency or the Director of the Information Security Oversight Office, shall render an interpretation of this order with respect to any question arising in the course of its administration.” Fitzpatrick has the power to ask Attorney General Holder to render an interpretation regarding whether or not the CIA can charge up to $72 for MDR searches (not to mention $15 for printing just one piece of paper). Count two of the National Security Counselors’ complaint seems to make it pretty clear that what the CIA did was illegal… I wonder what the AG would think. The fight goes on. And the Agency no longer has the advantage of surprise. Notice that fees are permitted under the Mandatory Declassification Review process. See paragraph 16f at the bottom of page 64. Any ideas on how to counter it? Good point. The key difference is that the DoD seems to have a much more reasonable fee structure– including a provision that if the total fees are less than $30, no fees will be charged. Still its of concern, and I’ll do a post on it in the near future. Also of interest is the requirement for Department of Defense components to establish programs to systematically review information for declassification. This requirement is stated in paragraph 17 on page 67 of the latest version of the information security directive DoD Manual 5200.01 Volume 1. Specifically required is “review for declassification information that is contained in permanently valuable historical records that have been exempted from automatic declassification”. The Air Force has set up a web site for declassified information but it looks like not all that much has been done. What if we come to find out the evildoer’s were created and suppoted by the CIA?